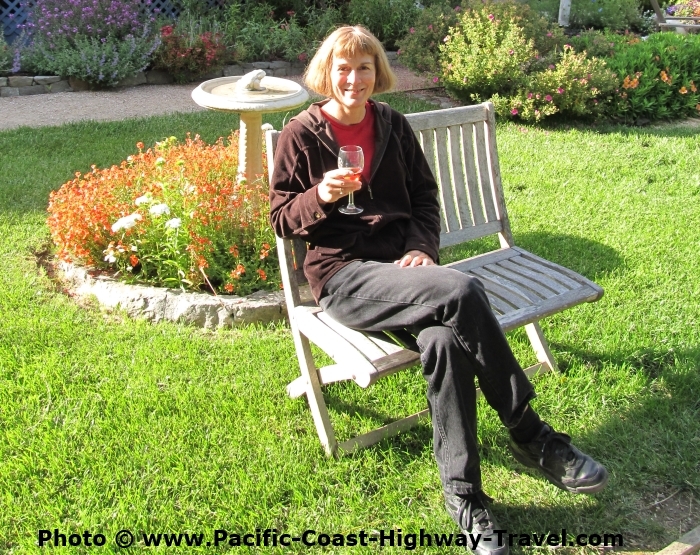 Pacific Coast Highway Travel's advice on driving the Pacific Coast Highway in two days, including the best places to stay, places to eat, and the best things to do and see. Driving the Pacific Coast Highway in two days is not ideal, as you will spend a lot of time in the car. You face a good 12 hours of driving, perhaps more if you hit heavy traffic. The maths is simple: about six hours each day. 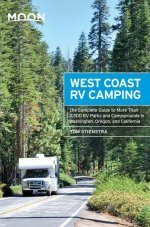 See here if you want to Drive the Pacific Coast Highway in Three Days instead, and here if you want to Drive the Pacific Coast Highway in Four Days. However, we've had emails through our Contact Form asking how to do it. If you're in California and only have two days to spare, and you want to drive the PCH badly enough, you can do it. You will have to make a few compromises, though. For the sake of argument we're going to assume you're starting your drive in San Diego on the morning of Day One, and you need to be in San Francisco on the evening of Day Two. Simply reverse the route if driving from San Francisco to San Diego. Our suggestion is that you try to hit the road by 8am or 9am. 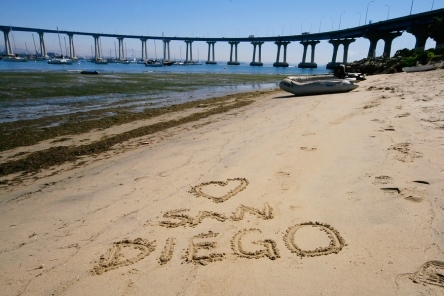 Our first bit of advice is to leave San Diego on I-5 and stay on it, skipping the surf towns south of Los Angeles. Places like Huntington Beach and Laguna Beach are fun places, and not to be missed if you had more time, but driving along the coast takes you right through the town centers and adds to the driving time. It's not the best way to approach Los Angeles, either, as it would add yet more to your driving time. So stay on I-5 for about 110 miles until you get into Los Angeles. Don't underestimate how long it will take you to get through Los Angeles, even on an interstate. The traffic can be gridlocked. In Los Angeles at the big intersection where the north-south I-5 meets the east-west I-10, follow the signs for 101 North. You'll then stay on 101-N for another 100 miles before you hit the coast at Ventura. North of Ventura you'll reach Santa Barbara. It should take you something like four hours to get here, mainly because of the LA traffic. If you were able to set off at 8am or 9am it will be time for lunch and Santa Barbara has no shortage of good eating places. You can stretch your legs by the sea, too, maybe take a stroll on the sand. You can also breathe a sigh of relief that you've now got the worst behind you and the best is yet to come. From Santa Barbara it's maybe a couple of hours' drive to our recommended overnight stop in Cambria, so you can take your time a little in Santa Barbara where there's plenty to see. It's also good for shopping, if that's your interest. 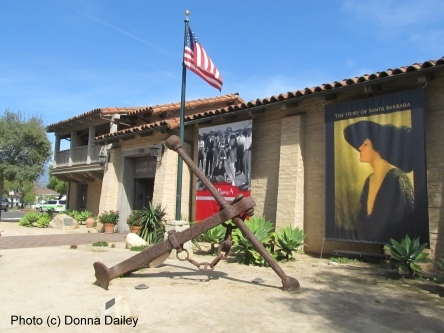 Our top three choices of things to see if you don't have too much time would be the mission, the county courthouse and the historical museum, though you'll need at least an hour or so to get round the museum. 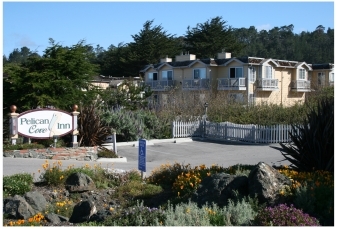 It's up to you, whether you want to spend a little more time here or you want to get to Cambria and relax for the evening. We've chosen Cambria not only because it's a good halfway point, but also because it's a lovely little town with a good range of places to stay and places to eat. It's a unique spot, and we love it. There aren't any major attractions as such, so you don't need to feel you have to get here before things close. If you've booked your accommodation ahead then check if they have either a happy hour or complimentary drinks and snacks in the early evening. Now that's something to aim for! It's the perfect way to relax after several hours in the car, and get to know your fellow guests and travelers. In Cambria we love eating at the West End Bar and Grill, if you want good but inexpensive food, although there are several fancier places too if you want fine dining. That's the joy of Cambria, it packs so much into a small place. Another option, if you get here early enough, is to do an evening tour of Hearst Castle. 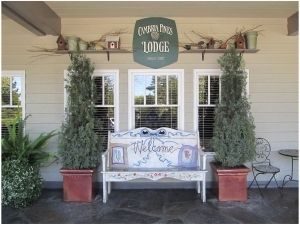 They're quite special, if you're up for it, but you would have to book ahead or give them a call once you reach Cambria. But if they're all full or you want to try somewhere else, there's no shortage of great places. Aim for an early start again as you have another six hours or so of driving, depending on traffic. There isn't quite as much driving today, and your main job is to decide what you want to see. You will have some sightseeing time, though not enough to see everything. Just north of Cambria is Hearst Castle, and we highly recommend it, but it will take at least a couple of hours when you factor in parking, buying tickets, waiting for your tour etc. You can do it, but if you do this there won't be much time for other things. As we say, the choice is yours. For some people Hearst Castle is the thing they want to see along the Pacific Coast Highway, though if you have kids with you then north of Hearst Castle is Piedras Blancas Beach, or Elephant Seals Beach. 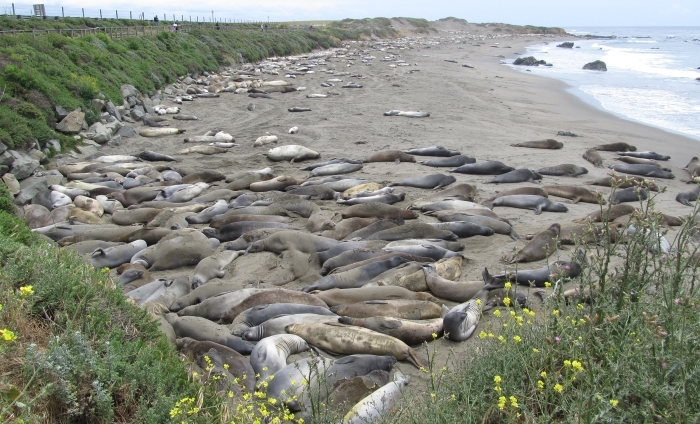 For anyone who likes wildlife (and we do) this is a must-see stop, and kids will be fascinated by these enormous elephant seals just a few feet away from you. On a 2-day drive up the Pacific Coast Highway you'll have to limit your time here, as there's much more to come, but you should certainly stop if only for ten minutes. If you drive along the coast then from Cambria to Monterey or Carmel is about three hours. This means that with an early start and without a visit to Hearst Castle, you'll be there in time for lunch. 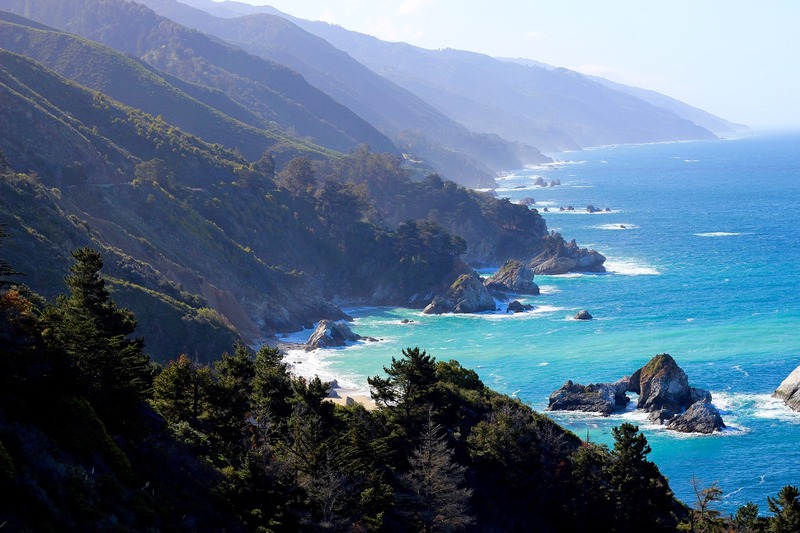 The most beautiful stretch of the whole Pacific Coast Highway, and what most people want to see, is Big Sur. In some years recently this stretch has been closed, due to winter storms and/or mudslides. If the road is open, as it normally is, this will be one of the highlights of your drive. If it's closed then you can still make the drive with a detour inland and you will still see almost all of the beautiful Big Sur coastline. The detour will add about an hour or so to your drive. So, Carmel or Monterey? If you're traveling as a couple then consider Carmel. You can have a nice lunch there, walk around, do a little shopping, and be back on the road. You might still have time to pop into Monterey and have a look round there too. Monterey Bay Aquarium. Photo by Donna Dailey. 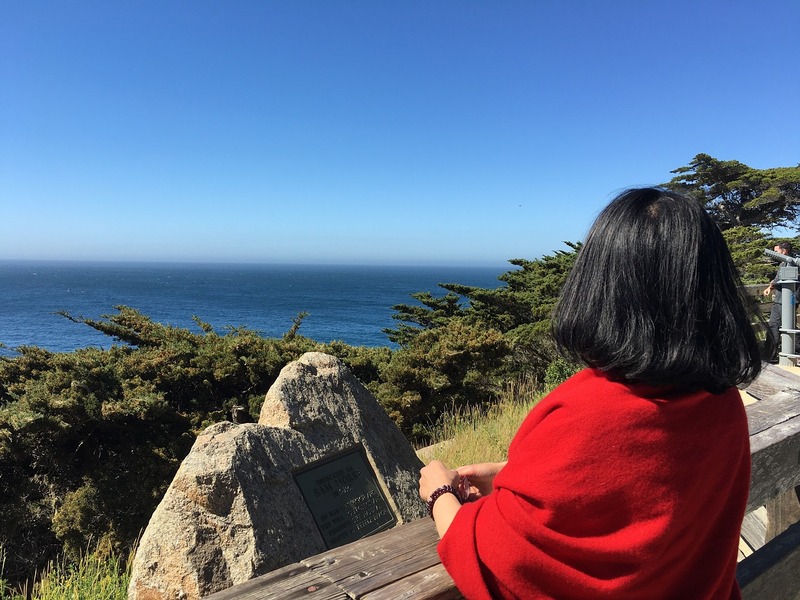 If you're on a family trip then think about Monterey. It's much bigger than Carmel, you could visit the pier and watch the sea-lions and maybe have lunch there. 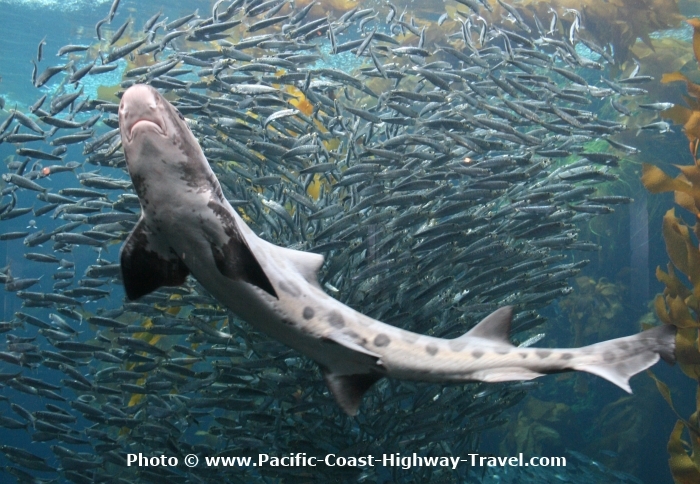 It also has the biggest attraction that you might want to find time to visit, the Monterey Bay Aquarium. It may be one of those cases where you have to make a brief visit but you say to yourself that you have to come back for longer. We would say you should allow 2-3 hours for a visit. If you only have one hour then you'll still have a wonderful time, but you will want to come back. From Monterey or Carmel to San Francisco is a 2-3 hour drive to the center of San Francisco, or a little less if you're headed for the airport. 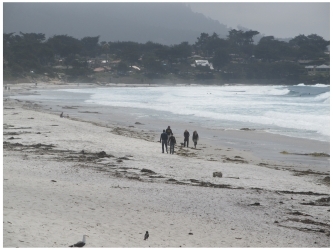 Our advice would be to spend as much time as you can manage in Monterey and Carmel, and then hit the road. The drive from here takes you to Santa Cruz. It's about an hour to Santa Cruz at the most. 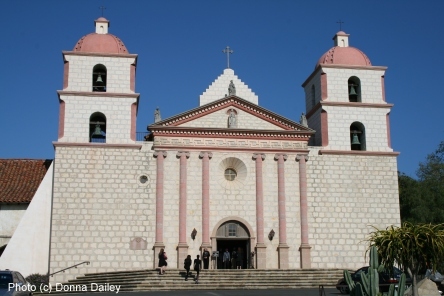 Depending when you leave Carmel or Monterey, you could take another quick break in Santa Cruz. From Santa Cruz you have two choices. You can take the Pacific Coast Highway (Highway 1) along the coast or you can take Highway 17 towards San Francisco International Airport and on into San Francisco. It depends how much time you have. From Santa Cruz to the airport is about just over an hour if you go on Highway 17. If you go along the coast and make the most of the Pacific Coast Highway then allow for two hours. From San Francisco International Airport to central San Francisco is about another 15-30 minutes, so adjust accordingly. So driving the Pacific Coast Highway in two days is possible. 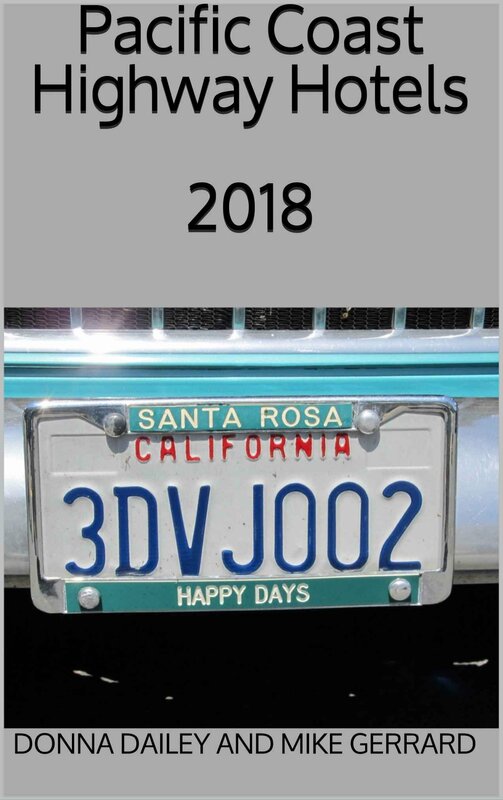 Three would be better, of course, but in two days you can get from San Diego to San Francisco or the other way round and still have a little time to spend in one or two places along the way. Happy travels!